Before you enter the Museum you are taken back by the beautiful detail and texture of the building itself. The building represents an old style century design and was huge in size. 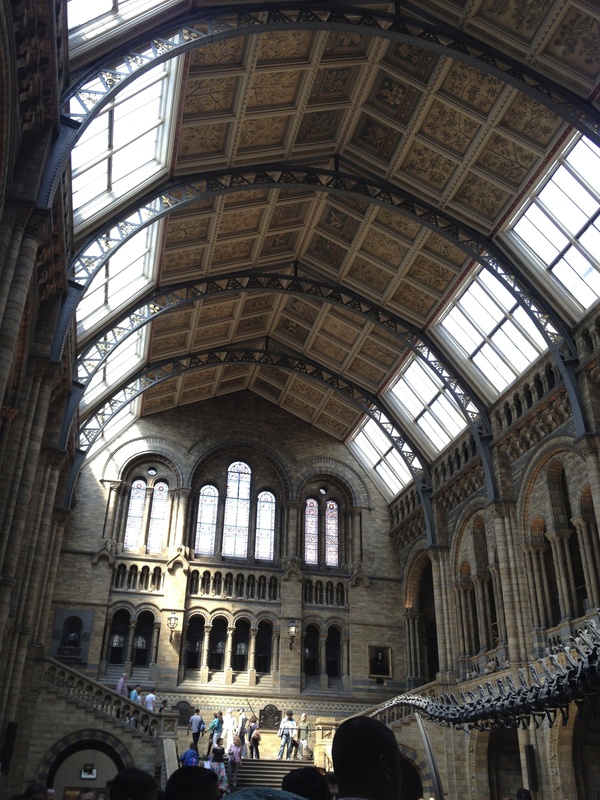 The Natural history Museum first struck me by how detailed the architecture was throughout the whole entire building. It resembled almost the inside of a church Cathedral. There were several amounts of detail on the walls. The windows were also placed as a church may have looked as well. I believe that churches are a big influence on the designs of buildings throughout the city of London itself. The arcs on the top of the ceiling were beautiful. London is known for its very detailed architecture buildings and designs. This is an example of the space of London and how its buildings are occupied in it. That is “Englishness” and a tradition of London. It was interesting to see the dinosaur bones they had there as you entered the building. This was interesting because it made the exhibit very impressive as I first walked into the building. There were several monuments of different historical people. The live robotic dinosaur exhibit was very interesting and different. Inside each exhibit were different types of animals, mammals, and other creatures. What made each exhibit a little bit different from the museums in New York was that they all seem to have that architecture look to them because of the walls that are surrounding the exhibits. I feel that if the walls would have been plain or dull, that the exhibits would not have given me the same impression that they did with the detailing. It also was very interesting to see the different types of animals that they had on display. The Museum itself was very busy. There were a lot of lines and people stopping to take pictures. The museum had many different people from all different places around the world. There were many different languages I heard throughout the exhibit. Since London is known for its diversity of bringing different people to its city, this museum would no doubt be a popular one. I believe that the tourist attraction to the Natural History Museum is part of London’s actual “Englishness”. I believe that it is a part of London’s “Englishness” because there are an unbelievable amount of monuments and sights to explore in London. The city is unlike any city’s I have seen. One thing I have noticed is that London preserves its older buildings. Even though this museum was not necessarily an older building, I believe that the design of the building was definitely influenced by the older ones. One thing I really enjoyed about the museum is watching so many different people together enjoying the history of our world. It doesn’t matter where they are from; everyone was interested in the same thing there. I’ve never been to museum where it was so diverse and cultured. I believe that the culture is another reason that really gave me a sense of Englishness in the museum. 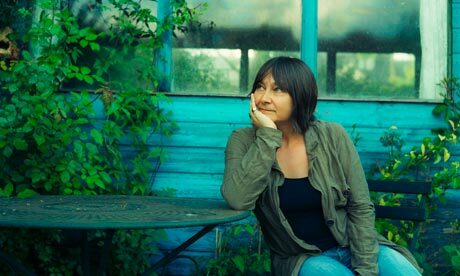 This interesting and captivating novel, “There but for the” by: Ali Smith had an example of how women occupied the space of London. This novel is of a newer based time frame, so the woman, Anna, in the novel has more rights than some other women in other novels like in “The Emperors Babe”. In this novel on page 36 of the “There” chapter, Anna describes her work place and how she did not enjoy it whatsoever. Unfortunately the decision to keep a job differs to people of different class. Anna needed the money, so that fact would alter her decision on if she would keep her job or not. On page 36 it states, “I bet you are broke because of the recession, or are you a student or a post-graduate? No, I had a job but I gave it up, Anna said, because the job I had was rubbish.” “In my job I had to make people matter not so much. That was what my job really was, though ostensibly I was there to make people matter.” I believe Anna here s describing a therapist or physiologist job she once had in the past. Since there was a recession going on, Anna most likely needed to be working to have some money to survive. Here Anna was occupying the working space of London with the working class. She then goes on into further detail about the job she had on page 37, “This was what my job was. First, I had to get people to talk to me about stuff that happened to them, usually pretty horrible. That’s why they were having to tell me in the first place, so that I could help them. Then, because there was pressure on me, I had to put pressure on them, to fit these true stories, their whole life stories in some cases, on just two-thirds of one side of, do you know what A4 is?” I believe that this passage shows how women of the century have much more choice in what they want to be studying and what fields they want to be working in. I believe this shows that women are more independent in society and not as dependent on a man because of restrictions they faced in the past. Another quote on the same page states, “But they told me how good I was at the job, then they gave me a promotion which meant I would make more money. But my new job was to make people redundant, the one’s who were doing my old job and weren’t good enough at getting peoples stories to be less long. So, in the end, I left.” This shows the power a woman has that she can actually make her own professional and educational choices in her life. On page 42 it talks about when Anna was 18 and coming home from the University. This shows how Anna was involved in her own life goals in London. Anna’s personal views and goals are accepted in this century of London. These passages describe that women are treated with more respect toward their aspirations and decisions they make in their lives. There are many specific references for “Mapping Englishness” located in Tamar, Yoseloff’s book of poems called “Formerly”. 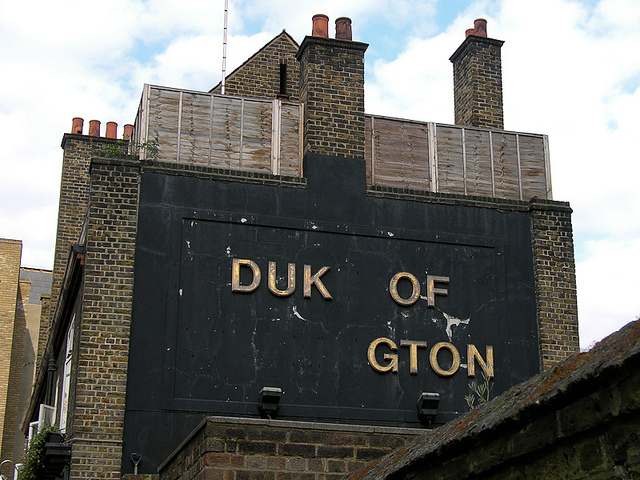 The “Duk of gton” explains how this space affected the character in the poem. This space provided the character with a memory. I think that the picture in the poem itself is a good indicator that this poem was set for a memory. 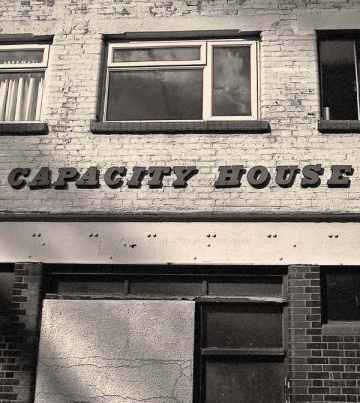 It visually shows words on the building not being there which means they have fallen over time. It also shows how the building is turning into history and just a memory and the character is having a hard time letting go. On page six it states, “Gone, the days of ho fun duck, back of the truck fooling around, white guy funk, goon squad drunks, a ton of laughs.” This poem tells about the space a person had that was once a place of happiness but now overtime has made the person feel an “ache in their brain”. Throughout the novel there are all different sort of pictures and poems that reflect the picture being shown. Each picture is in black and white almost as if it is reflecting a memory or it is taken place from a while ago. The novel itself even goes with an “off the map, exhibition” booklet where you can actually go to travel and see all of the sights. This is an extreme literal meaning of “Mapping Englishness”. I like that in the booklet it shows the difference a few years can make of a space like a building. When we met her and the author spoke to us, she even talked about how some of the buildings were not even around anymore. I believe that each poem is reflecting some sort of background of the space in the picture. I believe these specific landmarks are a way to Map Englishness because it describes actual spaces in the City of London itself. It references these specific places and how they are affecting their society and people around them. The novel “The City of the Mind” By: Penelope Lively shows several different ways of “Mapping Englishness”. This novel provides a tragic historic reference to the Blitz. On page 119 it describes the Blitz, “The whole sky is a brilliant orange, with the plump shapes of balloons floating against it as clear as by day, and incandescent columns of smoke boiling upwards, grey-black touched with red. The scarlet blizzards of sparks, the drifting clouds of red embers; the silver arcs of water jets against the banks of smoke. The shrill descending whistle of high explosive bombs, and then the dull prolonged boom, shuddering away into silence.” That is a very descriptive passage on what they Blitz experience was like for Matthew. This reference in the story to the Blitz is a very important part of Englishness. It describes the tragedies that thousands went through in London. On page 85 on the novel, Matthew and Jane visit the “Royal Museums Greenwich” National Maritime, Planetarium. Some information I found interesting on the history of the planetarium was, “The National Maritime Museum (NMM) was formally established by Act of Parliament in 1934 and opened to the public by King George VI on 27 April, 1937. 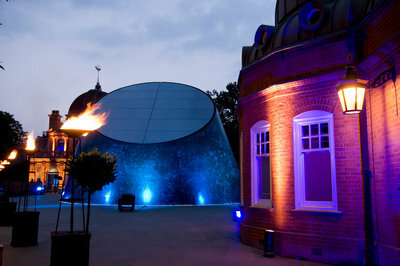 It includes the 17th-century Queen’s House and from the 1950s, the Royal Observatory, Greenwich”. I believe this novel offers numerous historic information. It is definitely a key source to “Mapping Englishness”. 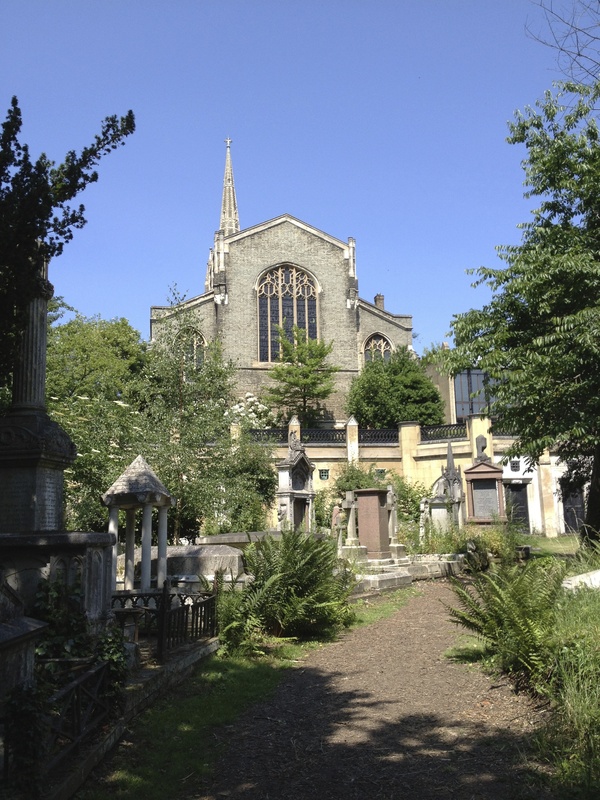 These historic places and references are what makes London the city it is today. The good things, like the historic history museum and also the tragic things like the Blitz. This history makes London what is now. People and their spaces shaped the city of London. 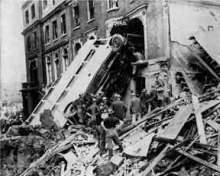 The Blitz was an event that took advantage of London and made the people of the city live in fear at the time. The people of London had to shape their space to protect themselves. According to the article people were so afraid of their homes being bombed at night that some would sleep in the underground tube stations and others would sleep in “Anderson Shelters” if they could not protect themselves. This passage here I believe is important to London’s Englishness and where it stands in the present day. It is pointing out how people are not even acknowledging historic and very intellectual people who changed are world. It is explaining how these monumental, and inspirational people are just being ignored by others. They are rushing past them like they are not important at all to history. I think it is also trying to say that the people may have been not paying enough respect to them. These historic references throughout the novel trying Map Englishness and are a part of what makes London the city it is today. 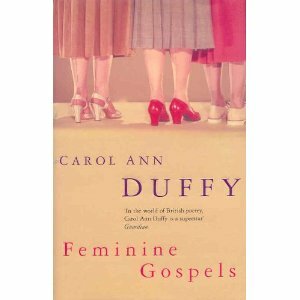 The novel “Feminine gospels” By” Carol Ann Duffy gives a very poetic look at they way women occupy the space of London. The poems describe many different aspects of English women in London. They all have a different story and occupy their spaces in a unique way. One of the poems in the novel is called, “The Map-Woman” it explains how the woman’s space (which is London) is pretty much made her into the person that she is. She describes that physical features of her body could actually represents spaces that she occupies throughout her city. The London itself as a result has actually become a part of her. On page three it states, “The woman’s skin was a map of the town, where she’s grown from a child. When she went out, she covered it up with a dress, with a shawl, with a hat, with mitts or a muff, with leggings, trousers or jeans, with an ankle-length cloak, hooded and fingertip-sleeved.” This passage is also describing what kind of role that society plays on her as well. It is describing the culture of London and what is expected of women to wear in that society. It is tradition that women should cover up her body. But this passage is describing that by covering up her body she is actually taking away from who she really is. It is as almost if she is hiding behind the articles of clothing and not being fully allowed expressing herself and who she really is. The passage on page six also states, “She piled on linen, satin, silk, leather, wool, perfume, and mousse and went out. She got in a limousine. The map perspired under her cloths. She took a plane. The map seethed on her flesh. She spoke in a foreign tongue.” I believe that this passage here also further goes off the idea of women being covered and wearing the appropriate clothing in society. But I also believe that this passage is very important to women occupying space as well. It seems that when you are a foreigner to another country you pretty much bring your culture with you. You are identified with the place that you are from and the space there that you grew up in. I think that is a very clever way of explaining how your culture travels with you by the map being a physical part of who you are. Another poem that I found interesting was “The Woman Who Shopped”. This poem here was describing women who blew a lot of money on material possessions. I found an interesting passage on page 18 stating, “Her ribs were carpeted red, her lungs glittered with chandeliers over the singing tills, her gut was the food hall, hung with pink hams, crammed with cheese, fruits, wines, truffles and caviar.” This passage in the poem reminded me of the way the physical similarities were written in the other poem, “The Mapping-Woman”. This one was a little different though. It describes how the women have become so infatuated with shopping and material possessions for happiness she is starting to become into a material possession herself (metaphorically speaking). But the descriptions show that she has surrounded herself in the space for so long it is actually taking over the person that she is. I believe both of these poems in her novel show how different the women are occupying their spaces.